The Mueller investigation is proving to be a relentless source of inspiration for interactives and data visualization projects. 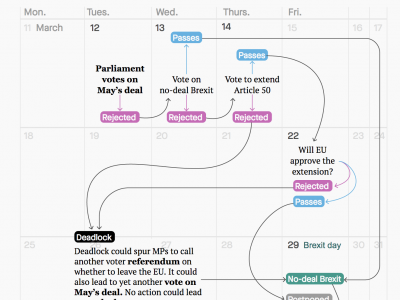 This story from Bloomberg focuses on several areas of the investigation, providing an interactive timeline of events for each of them. The article stands out as it relies on the visual cues of criminal investigations (the web of suspects, the yellow tape, the B&W portraits). The dynamic graphics also help identify the wide array of characters and charges in the Trump/Russia scandal. And it’s honestly pretty fun to read.